HomeHome 1 Blog UpdatesI hate seizures. Don’t worry this picture of Nick was not taken recently. It is from a few years ago. However, lately I have been reading posts and queries from parents of newly diagnosed children with epilepsy. My heart breaks for those families over and over. As I read their stories, I can remember all the swirling emotions of my own. When Nick was diagnosed with epilepsy, I desperately wanted to find something. I wanted to believe that there was a cure, or a particular new drug therapy or a treatment that would make the seizures go away for good. I had hope. For some kids and their families, that does happen. For others, like Nick and our family, that is not our story. Even now, with 37 years of experience, every time the seizures start, I am a little bit surprised. Whether it has been a week or a few months, or longer, since the last episode, I always hope that we have finally found it. 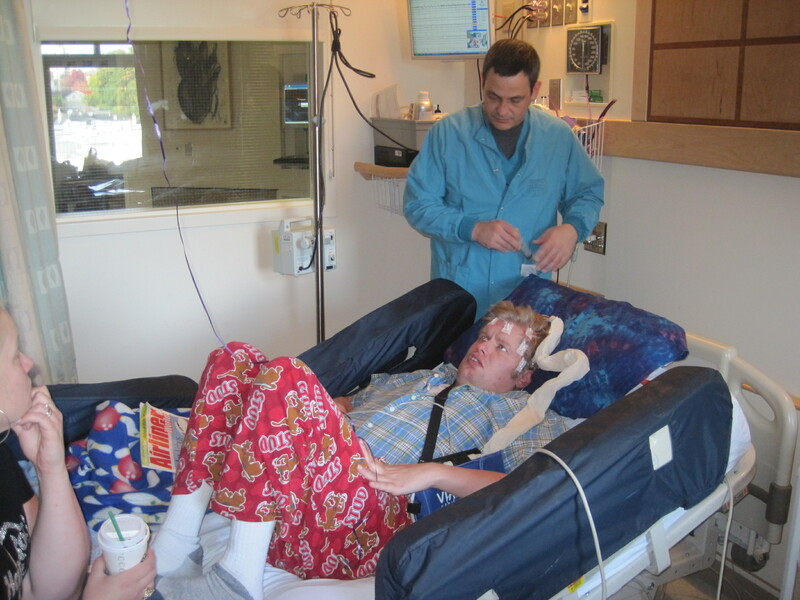 So in those first moments of helplessness watching my son in the midst of his seizures, the swirling emotions return. I want to rail at the heavens, and I want to be humble and accept Gods will. I want to be strong for Nick and for those who are witnessing it and I want to run away and hide. I am afraid that they won’t stop and I have faith that they will. With my thoughts running around in my mind, Arden and I step into the dance that we know so well. We time the seizures, we chart the data, we talk to the doctor, we administer the rescue medicines in the prescribed pattern. Over and over, for hours and then sometimes, when we have followed the entire protocol and the seizures haven’t stopped, we call the aid car. The paramedics come, and the ambulance takes us to the hospital where they battle for us to stop the seizures. So far, every time, they have stopped. We are told that someday they might not. That frightens me too. I have watched some of the videos posted by these new parents, asking others if what is shown is a seizure pattern. They express that they are new at this. They say that they don’t know yet what to look for. How can I tell them that will never change, you will always wonder. It is hard to explain, but everyday I wonder if today is going to be a seizure day. Out of habit, I react to every odd movement, sound or response, questioning if it is the start of a seizure pattern. If Nick falls down, I don’t ask him first if he is ok. I ask him if that was a seizure. If he says no, then I ask if he is ok. If he says yes, we start the dance again. Arden told me that he thought I needed to share some of the difficult things and not only the uplifting things about taking care of Nick. I am interested in hearing your comments, just be gentle. I feel vulnerable and a little raw.